the gold museum has the biggest collection in precolombine pieces adquired by the republic bank. The Collection changed frequently to keep up and being updated, to get visitors always excited discovering and marvel with it. The gold Museum of Bogota exposed the hugest gold handcraft exhibition, surpassing the international Gold museum of lima. With the Lastest update to the gold museum the foreign speaker tourist will find a tour guide, in the language of their needs. 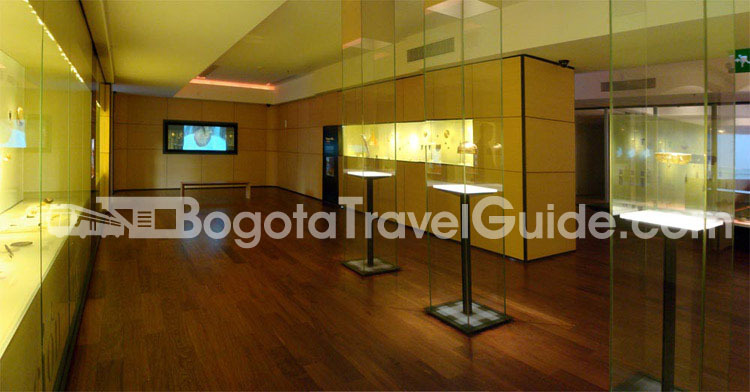 The Bogota gold museum was extended with a whole new building and 4 exhibition room, making even complete the visit to the museum; with all these objects we could understand in a better way how was the life, customs and the region of our precolombine indians, offering over than 8.000 objects accompanied with images and sounds making this in an unique unforgettable experience. The museum has different rooms with representative themes like, stages in history, cultures, ceremonies, agriculture, dress codes etc... from the pre-hispanic age; the visit also could be guide in different languages, conferences, videos and roving samples. was submerged all over with gold powder; all this ceremony make place to "El Dorado" leyend. Monday: Closed, even the holidays. / Tuesday to Saturday: 9:00 a.m. a 6:00 p.m.
Open from 10:00 a.m. to 4:00 p.m. Good Thursday, July 20th (Independence Day) and August 7th (Battle of Boyacá). Spanish: 9:30 a.m., 12:00 m. and 2:30 p.m.
English: 11:00 a.m. and 4:00 p.m.
Spanish: 11:00 a.m. and 2:00 p.m.